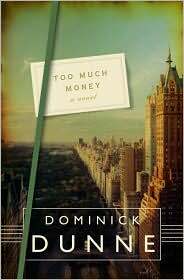 Dominick Dunne’s Too Much Money reads like an advanced season of the Upper East Side teen drama “Gossip Girl,” a place where rumors run as fast as opposable thumbs can text them. In his final novel, Dunne revisits characters from People Like Us, which he wrote in the 80s, featuring versions of his friends, enemies, and acquaintances from the fancy schmancy moneyed world of NYC dinner parties. Gus Bailey is an embedded journalist walking among people whose donations to the city’s library surpass his legal fees from his public insinuation that a certain congressman was more involved in the death of a young woman than he is admitting. Bailey is a person people tell things to (much like Dunne always described himself when he was writing for Vanity Fair and covering things like the OJ Simpson trial). Dunne writes about these characters as they make chess-like moves through society. In this episode, Bailey is writing a book about Perla Zacharias, whose billionaire husband died under suspicious circumstances; hanging out with Lil Altemus, whose financial situation is so bleak, that she must move out of an apartment with a dining room that could easily serve dozens and into a smaller space. There is a rumor that Altemus was seen waiting for a bus. A bus! ; Ruth Renthal is preparing for the release of her husband Elias from a Federal “facility” — she refuses to call it a prison; Addison Kent, a walker, is trying to climb up the social ladder, and is a bit of a kleptomaniac. The most endearing character bids an early adieu: Winkie Williams is an extra man, and invited to every party. When he finds out that he has inoperable cancer, he plans out a suicide, sends expensive orchids to his posse of lady friends, dresses in nice pajamas, and takes a mix of pills and top shelf wine. This book is a delicious piece of satire, I think. It’s oozy goozy and bad for your teeth brain rot, but such fun. Characters are introduced over and over by a single defining characteristic. It’s hard to tell if this book is pure comedy on purpose, or because of Dunne’s personal writing ticks. In one scene, Ruth Renthal is introduced to Charlotte de Liagra, the gay wife of Renthal’s former lover. They form an immediate friendship, and Charlotte eventually propositions Ruth, who admits that she has never gone for the girl-on-girl scene. “I have to get a little drunker first. Pour me more champagne,” said Ruth. She didn’t know if it was the woman or the title that she was giving in to.